The Most Romantic Men in Yorkshire Revealed – is your name on the list? Local Romeos across the country are celebrated this Valentines Day as those who shower their loved ones in the most romantic way are named. A recent study by Serenata Flowers, one of the UK’s leading online florists has uncovered traditional romance is still very much alive, with 94% of men choosing flowers as their first choice for Valentines Day. 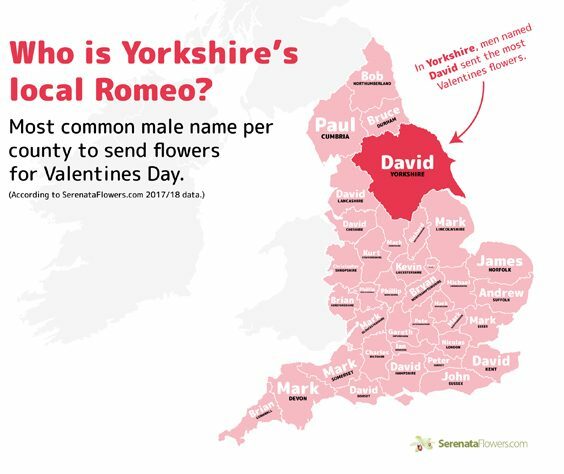 The Local Romeo Name Calculator unveiled that men named David sent the most flowers in Yorkshire. Warren in Doncaster, Geoffrey in Leeds and Keith in York all came out on top, whilst Mark, Ian and Paul sent the least flowers. Of flower senders, a heart-warming 82% of men in Yorkshire buy petals for the most romantic day of the year, whilst only 18% of women share their love this way. Poet Geoffrey Chaucer linked St Valentines with romantic love in the 14th century and ever since the nation has showered loved ones year after year on the 14th of February. Red roses instantly convey romance and continue to pull at the heart strings of many, so it comes with little surprise that in Yorkshire nothing says “I love you” more than a fresh bouquet of flowers. With an increase in digital gift giving, the UK floristry industry has taken note continuing to adapt to the ever-changing digital demand. This study shows that traditional gift giving is still a viable option for many across the UK with buying and sending flowers now easier than ever. Find out who the most romantic person is in your area with the Local Romeo Name Generator by Serenata Flowers.